For people in St Paul and the surrounding communities, I will be presenting at an event about the digital divide sponsored by the Alliance for Metropolitan Stability. The details are below, but the key detail is that you have to RSVP (no fee for admission). As the Internet and other information technologies have transformed our lives, we now benefit from greater connectivity to educational, employment and social opportunities in the Twin Cities. Yet low income communities, communities of color, and immigrant communities are often left behind. This exclusion deepens the divide between the haves and the have nots and reinforces the inequities in our region. Join us for our next Organizer Roundtable where will we take a look at organizations who are working to bridge the digital divide. Come and learn the strategies that they are using to provide access to underserved communities in our region. The event is at 12:30 on April 18 (Wednesday) at the Merriam Park Library. MPR News recently ran two stories on the trials and tribulations of new and prospective broadband networks. Conrad Wilson's story about the continuing Monticello drama and Jennifer Vogel's account of factors affecting the American Reinvestment and Recovery Act (ARRA) projects give us a good idea of the many hurdles in the way of building new fiber-optic networks. We have reported many times on the drama that has unfolded in Monticello. The municipally owned fiber-optic network has faced some withering challenges and yet perseveres. Bill Tapper, who owns a cabinet company with clients around the world, recalls a time just a few years ago when the Internet was so slow it hurt business. "The service we had in Monticello was horrible," he said. "My employees would sometimes take the data home where they had a better Internet connection than we did and do their uploads at night." Tapper said he lost out on business, but at the time the established Internet service providers like phone and cable TV companies told Tapper and other frustrated business owners in town that the city was wired sufficiently. After the community voted in favor of a publicly owned fiber-optic network, the incumbent provider, TDS, filed a lawsuit. The lawsuit strategically succeeded in stalling the development of the new network but did not destroy the project. Even though the incumbent provider describes pre-network status as "just fine before the city got involved," TDS took advantage of the delay they caused to began building their own fiber network. When Monticello, Minnesota, decided to build its community fiber network -- Fibernet Monticello -- it expected the incumbents to lower their prices and fight to keep subscribers. But Monticello had no idea the lengths to which they would go. The telephone incumbent, TDS, delayed the project for a year with a frivolous lawsuit and then built its own fiber-optic network while dramatically lowering its prices. We have yet to find another community in North America with two citywide FTTH networks going head to head. Because of the city's network, Monticello's residents and businesses have access to better connections than the biggest cities in Minnesota can get. Now, Charter has weighed in by cutting its rates to what must be below cost to gain subscribers. It reminded us of a shoot-out, so we created this infographic to explore what is at stake. Download a higher resolution PDF here. Charter has taken a package for which it charges $145/month in Rochester, Duluth, Lakeville, and nearby Buffalo (MN) and is offering it for $60/month - price guaranteed for 2 years. 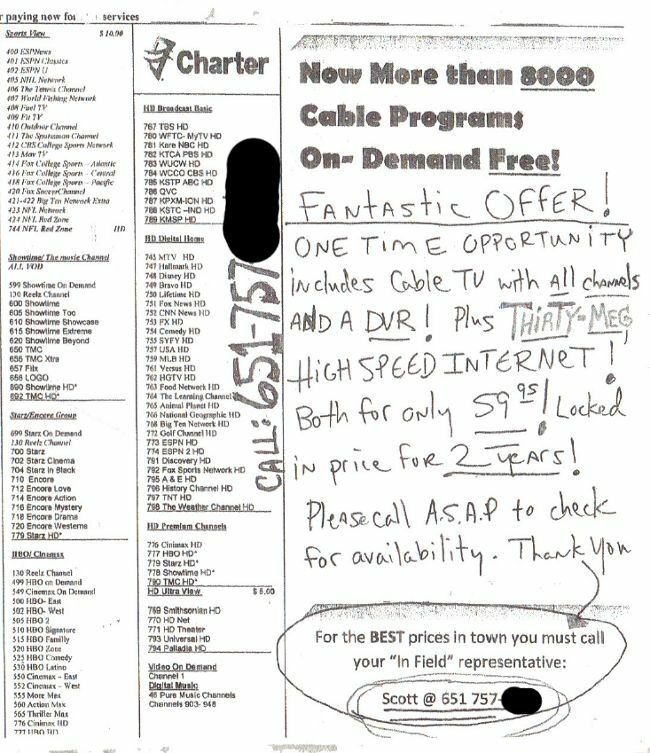 A Monticello resident supplied us with this flyer, which this person had received multiple times at their home over the course of a month. (See below for the full flyer). We have heard rumors that the Minnesota Cable Communications Association (MCCA) has ramped up its lobbying efforts in the capitol over the past few weeks and now we know why -- Representative Runbeck is today introducing MN HF 2695, a bill undoubtedly written by the cable companies. Update: Apparently MCCA is denying they are behind this bill. Given how blunt the bill is, I'm inclined to take them at their word. I would expect a bill by MCCA to be more strategic, refusing to admit they wanted to revoke all authority outright. Nonetheless, this bill is still a giant gift to the incumbent cable operators in the state. Much of Minnesota lacks access to next generation broadband networks -- the kind of networks needed for economic development and maintaining a high quality of life. Minnesota law already discourages communities from building their own next-generation networks but they still have the authority to choose. This bill would deny them a choice. If passed, MN HF 2695 would be a power grab by the state on behalf of big cable companies to prevent any threat of broadband competition, denying communities local self-determination on matters of essential infrastructure. MCCA has been trying to kill a broadband stimulus project on the North Shore that would connect thousands of people who have no access to modern broadband because it overlaps in places with Mediacom turf. Mediacom recognizes that if it can kill the network owned by Lake County, it will have no competition to worry about for the foreseeable future. Private telecom companies are not about to go overbuild rural areas or pick a fight with Mediacom. The only legitimate hope for a real choice in broadband in Minnesota is in areas where communities choose to do it themselves. We believe communities should be free to make that choice. The cable companies, and a number of elected officials in Minnesota, believe that communities should not be trusted with that decision. A rural Fiber-to-the-Farm project that started in Sibley County has added three new towns to its potential territory due to the extremely high interest in fast, affordable, and reliable connections to the Internet. The current providers aren't getting the job done and few expect that to change given the cost of improving services. Soeffker, who farms with her husband in rural Sibley County, said the dish receiver they must use works fine in good weather but balks during heavy rain and snowstorms. Meantime, her husband struggles with a lagging Internet speed of .6 megabits a second that falls short of meeting his business needs when he’s selling commodities. The committee organizing the network set a goal for demonstrating the interest of something like 50% of the population in the target area. There has been some confusion as to exactly how many they should have before committing to the project but with just two mass mailings, they have received nearly 3,000 positive responses (of the over 8000 households that could be served). This is a very strong response. To keep the public informed, they have had numerous public meetings in each of the communities that will be involved. To be as open as possible, they would often have three meetings in a town per day -- a morning, afternoon, and evening meeting to accomodate everyone's schedule. As this project moves forward, no one can claim the group has been anything but open with the plan. On January 19, they had a major meeting with over 100 people attending, including many elected officials from the towns. For over two and a half hours, they had five presentations and numerous questions. MPR's Jennifer Vogel was there and wrote about the project shortly afterward. Minnesota Public Radio has once again covered some of the many benefits coming from the stimulus-funded Southwest Minnesota Broadband Services that grew out of WindomNet, a small muni network. It is now offering some of the fastest connections in the region to people who previously only had dial-up or slow DSL. Schensted and his wife are the first in their southwest Minnesota community to connect to a new high-speed Internet service. He said the new service is everything it was advertised to be. "We're getting anywhere from 50 megabits downloading and about 20 to 30 uploading," Schensted said. "It's just really incredibly fast." Stimulus dollars spent on expanding publicly owned networks gets the most bang for the taxpayer's buck and should have been a much larger focus for the broadband stimulus. The people and businesses served by this network have faster connections at lower prices than we can get in the metro area of Minneapolis/St Paul. Schensted's house is connected to the nearly $13 million Southwest Minnesota Broadband Service project that will serve eight communities: Bingham Lake, Brewster, Heron Lake, Jackson, Lakefield, Okabena, Round Lake and Wilder. Schensted said he has never had that kind of Internet speed, even when he lived in the Twin Cities. "This is perhaps overkill for even my home," he said. "I'm not complaining about it, but it's a wonderful overkill. My wife and I can both be using a computer, we can be streaming something on the television, all at the same time which is something we wouldn't have dreamed of before." Smart public investments can connect everyone in this state, at a fraction of the price that it would cost to subsidize the big private companies to do it. They are too inefficient and require too large a margin of profit, in addition to a host of other problems. Exciting times in rural southwest Minnesota, as Southwest Minnesota Broadband Services has turned on its first customer. SMBS is a broadband stimulus-enabled partnership with eight rural communities and WindomNet, the muni FTTH network in Windom. The Rev. Andrew Schensted and his wife, Lisa, were the first to be connected. The fiber-to-home connection provides “obnoxiously fast Internet,” Andrew Schensted said in a SMBS press release. The SMBS Internet is “at least 10 times faster” than what they had when living in the metropolitan area, Andrew Schensted added. The couple has been able to streaming video in full HD from TV streaming websites. So it begins... the Metro around Minneapolis and St Paul have to rely mostly on Comcast for connections to the Internet. CenturyLink's DSL is generally slower and in many places, utterly unreliable. Monticello has had a blazing fast connection (faster than we can get in the metro) at lower prices for more than a year. Communities served by HBC also have faster connections in SE Minnesota. In the coming year, the stimulus-funded networks on the North Shore will also have better connections than we can get. It will be curious to see how development patterns adjust in the coming years. Southwest Minnesota Broadband Services (SMBS) is a consortium of eight communities including Bingham Lake, Brewster, Heron Lake, Jackson, Lakefield, Okabena, Round Lake and Wilder. The 125-mile, $12.8 million dollar fiber ring is expected to be completed in September 2012. The fiber-optic communication network has the capacity to bring fast, competitively priced services for internet, phone and cable TV to residential subscribers as well as businesses and other community institutions. The government grant-supported project is intended to provide southwest Minnesota with the telecommunications connectivity required to remain competitive in the global marketplace. Monticello, a small community of 13,000 about 40 miles northwest of Minneapolis, built one of the most advanced broadband networks in the midwest and delivers some of the fastest connections available in the state at incredibly competitive rates. The Twin Cities metro area, stuck mostly with Comcast and Qwest, cannot compare in capacity or value. Monticello is fairly rare in the publicly owned FTTH region because it does not have a public power utility and services on the network are provided by a third party, Hiawatha Broadband Communications -- a Minnesota company with an excellent reputation and track record. Unfortunately, Monticello's network suffered costly delays due to a frivolous lawsuit filed by the incumbent phone company in a bid to bleed the publicly owned network while it suddenly invested in its own second generation network (that it previously maintained was totally unnecessary for a small town like Monticello). Monticello lost a full year on the project, which has hurt its finances significantly. More unexpectedly, it has become the only community in North America where all residents have a choice between FTTH networks. They also have Charter in the mix. Add to this the economic downturn that hit just after they financed the network in 2007 -- the population growth has been much lower than forecast. The predictable result? Much lower prices, lots of community savings, and a publicly owned network that is behind its projections. The local paper recently ran a story about the project, "FiberNet struggles in a sea of red. Should you read the full piece, please be aware that the inaptly named "Freedom Foundation" has no credibility, existing solely to defend massive corporations like cable and telephone companies.